2013 saw Jason Chue AKA Wookie, release his own track 'The Hype' featuring Eliza Doolittle (Strictly Rhythm) and remix (amongst others) Disclosure’s 'Voices' (PMR/Island) and Wilkinson’s 'Too Close' (Ram/Virgin). All three records gained continued support from Radio One’s Annie Mac, Toddla T and Rob Da Bank, Kiss FM’s DJ EZ and 1Xtra’s MistaJam, DJ Target and Cameo. 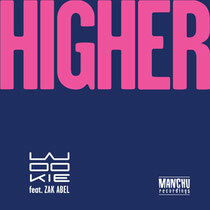 2014 sees the producer and remixer, regarded by many as one of the most influential founding fathers of UK Garage, return with the beautiful soulful track 'Higher', featuring the vocal talents of newcomer Zak Abel. 18-year old singer/songwriter Zak, hailing from North West London is introduced to the scene by Wookie and featuring alongside Zak is the sound of Rudimental’s trumpet player, Mark Crown. Check it out below, this is stunning. It’s out 14 April on ManChu Records.